Celebrate your love for someone special or congratulate someone on a life changing achievement with this complex and sophisticated flower arrangement. Pink roses are carefully combined with hypericum berries, yellow craspedia and butterfly pics in this striking bouquet. 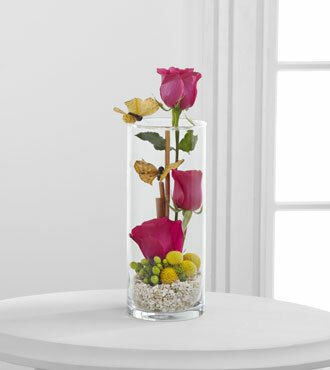 This fantastic flower arrangement is carefully arranged inside a clear glass vase.